For the Catholics, the Samba parade is a way of getting rid of the cares of the world before they spend the next days fasting and praying. For the secular, it is a time to celebrate life, culture, and dance. For those who get to see the parade, it is a combination of both. Contrary to popular belief, the Samba parade is not something ordinary. The participants don’t just dance to their heart’s contents. Preparation is done in months, even for a year. The samba participants are mostly made up of schools from various communities in the country. They don’t play the same samba music. In fact, virtually all of them compose their own tunes, which have to be produced by live percussions and wind instruments. The intricate designs of the floats and costumes are handled by the chosen designer for each school. The main event, which is the actual parade itself, is held in Sambodromo, a runway spanning more than 690 meters from Avenida Presidente to Rua Frei Caneca. Each of the sides is then lined with boxes, seats, and benches where the audience can gather to watch the parade. At the end of the narrow pathway will be the open square, where those who are not able to enter Sambodromo can assemble. You should also not miss attending at least one Scala balls. Bars, clubs, and restaurants come alive as entertainers play the best Latin beats. Everyone is free to hop on the dance floor. This also proves to be one of the best times to meet new people while you are in Brazil. However, most of the action is found near or outside the stadium. At least a week before the actual festival, majority of the streets will already be filled up with people and tourists who are in Rio just to party. 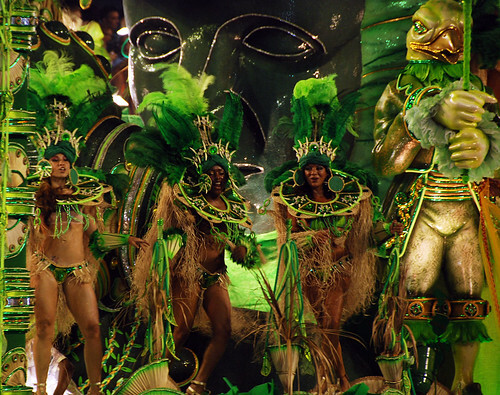 The nearby provinces such as Sao Paulo, Bahia, and Minas Gerais have their own samba parade versions. Community residents troop down their streets with their own stereos and instruments, and participants are free to follow the improvised parade and the rhythm of the samba music. The festivity, fun, religious, and cultural storylines that surround the parade are just some of the many reasons to be there. It is only wise that even a year before the actual parade, you should already create your travel plans. There are several websites, such as About U Travel, that can arrange your Brazil trip according to your specifications, including a side trip to the mystical Amazon. You just have to send a request. The Article is written by http://www.about-u-travel.com providing Holiday package deals and Package holiday Services. Visit http://www.about-u-travel.com for more information on tours and travels.___________________________Copyright information This article is free for reproduction but must be reproduced in its entirety, including live links & this copyright statement must be included. Visit About U travel for more services!